National Fuse is a leading supplier of automation and industrial European electrical fuse components. Our European fuses meet domestic and international standards: UL, NEC, CSA, IEC, VDE. 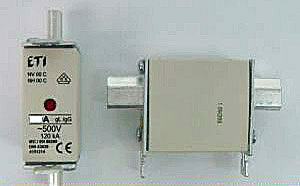 National Fuse European electrical fuses include DIN Standard and British Standard. European Diazed and Neozed bottle fuses have available accessories including screw caps, adapter screw/rings, fuse bases and fuse covers. National Fuse carries a wide variety of bottle fuses, cylindrical fuses and knife blade fuses.